Are you a “quilt person”? I’ve slept under them, written about the people who make them, and watched them go up for auction. 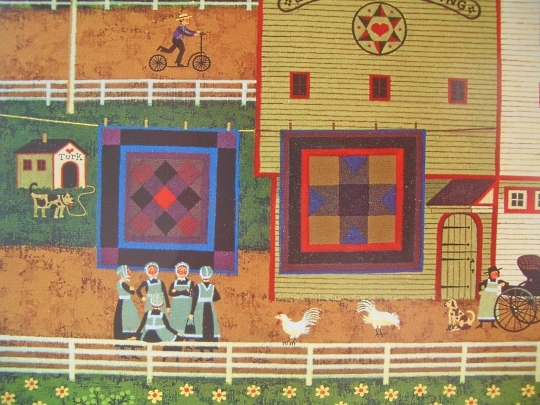 But I have to admit, I’ve probably under-appreciated Amish quilts, and quilts in general for that matter. Lately that has begun to change. I’ve got a section on quilts in an upcoming book. That led me to learn a bit more about things like piecing and appliqué and what happens to quilts with flaws. Still, a few questions come to mind. Who better to ask than the Amish America community? Why do people love quilts–Amish or otherwise–so much? What’s your favorite pattern or style? Are quilts–and quilting–strictly for women? I will be travelling to Wi early October. Having previously visited PA many times, I have been lucky enough to come across some of the wonderful fabric outlets used by Amish quilters. I am a quilter. Are there any such places in WI? Yes, I am so happy to be able to say I AM a quilt person. I retired from teaching in 2008. I was so bored. My husband suggested I volunteer in our church’s quilting ministry, so I did. I absolutely fell in love with it, so I took quilting lessons and am firmly hooked. I’ve made several quilts for everyone in my family. I now have a fabric stash, several sewing machines, multiple tools and notions, etc. I’m constantly looking for new patterns that I love. Glad to read these articles about quilting. I always loved to sew but with full time job and being a single parent I couldn’t dedicate enough time to quilting. After I retired I sew everyday and enjoy every minute of it. My problem now is that I have quilt tops that need to be hand quilted and I am looking for experienced quilters to work on them. You mentioned your church’s quilting ministry. Do you think maybe someone or a group will be interested in quilting my tops. Pay is good and it can be a long term work since I can’t and don’t want to stop sewing. I am happy you are happy quilter. No, Quilting is not for women only, there are some men that do it and love it….. I never did take this hobby up, but wished I had……I used to watch her piece the patterns together and then sew them all together and then quilt them…. There are some beautiful quilts out there…..I have a couple that were given to me , but I don’t use them…they are too pretty to use :)…..don’t know what I am saving them for….should get them out and use them….would come in handy this Feb. weather we are having…..BRRRRRRRRRRRRRRR…..-0 is no fun……. Are you thinking of quilting Erik, go for it…..and keep us posted…..
Forgot to answer your other questions…. Yes Quilts are definitely ART…. What do Amish think about modern music?